buy now The Festival is proud to present this pageant to find the new Cornbread Queen. This is a prestigious award in our community; the Queen represents the festival throughout the year. 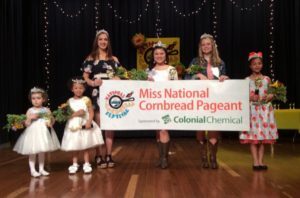 more info The Miss National Cornbread Queen in the oldest age group receives a $300 cash prize. There is also a cash prize for the winner of each age group. For the latest on registration and other important information check our Facebook page by clicking the button below.